I work full time promoting church growth in a world where church growth is a multi-million dollar industry and the church is not growing. Millions are spend every year on books, CDs, conferences, DVDs, web pages, research and consulting and the church is not growing. I believe the reason this is true is that the central message of the church as we preach it is different from the central message that the early church preached. It is not that the things we are saying is not true; it is just not what occupied the constant agenda of Christ and His early followers. We talk about, "How to go to heaven when you die." They talked about the kingdom of God. We have a hard time understanding the concept of the kingdom of God because, well, the whole concept is foreign to us. We don't talk about kingdoms much. You don't hear about kingdoms on the news or in the media. People Magazine rarely mentions kingdom. The world of the early church had an equally difficult, though completely different reason for not understanding what Jesus mean by his kingdom. They were VERY familiar with the word kingdom. But, they meant something totally different than what Jesus meant by it. In the first century, when someone spoke of a kingdom, they meant a government with an army and taxes and a palace and a throne. They thought of a country. That is why, when Jesus said, "The kingdom of God is within you." Luke 17:21b (NIV) They didn't quite get it. It seems they were still looking for a political kingdom. They still wanted to join the army and overthrow Rome. If they listened to Jesus for three years and still didn't get it, we might express a bit of humility in admitting that we might not get it either. I for one feel a need to look more deeply into what Jesus meant by His kingdom. It was the constant central theme of His preaching. What did He mean by it? One more thing. Many of you reading are teachers. There is a message here for those of us who teach. If Jesus taught his disciples for three years and they didn't get it, is there any chance the people we teach don't get it? Here it is: the kingdom of God where God is acknowledged as king. If you would like to hear more the idea of the kingdom, I recommend the preaching of John Ortberg. http://www.mppcfamily.org Ortberg talks about the kingdom the way Jesus did--constantly. I have listened to pretty much every sermon he has preached for years--many of them more than once. I am not sure where my thinking on this starts and John Ortberg's begins. Suffice it say I am deeply indebted for John Ortberg's teaching on the subject. John Ortberg, in turn, is self-described as deeply indebted to Dallas Willard--Divine Conspiracy, Renovation of the Heart, The Spirit of the Disciplines. John Ortberg points out that even though we don't use the word kingdom much, we are deeply interested in the concept of kingdom, even from the time we were very young. We want to know: who is in charge? What do I control? How big is my kingdom? Can I take your kingdom? Some of the early words that children learn are, "mine" and "no." These are kingdom words. They suggest that this is in my kingdom and you are not to violate my kingdom. From very early in life we are interested in the idea of kingdom. I remember when my boys were young that they would invariably fight in the back seat of the car. We would be driving down the road enjoy some music or a conversation and POW! a loud scream would come from the back seat. "He hit me! He touched me! He pinched me! He punched me! He took my teenage mutant ninja turtles! Mine! It is my teenage mutant ninja turtle! So, in my infinite wisdom, I came up with a plan. We would define the kingdoms. We would draw a line down the middle of the back seat. "Dustin, this is your side. Dawson, this is your side. Dustin, you don't get into Dustin's side, and Dawson, you don't get over onto Dawson's side." And, there was peace in the Hunt car. . . for about 6 minutes. Then: POW! "He hit me! He threw something at me! He took my teenage mutant ninja turtle!" Or, my favorite, "He looked at me!" The plan clearly wasn't working. So, in my infinite wisdom, I designed a new plan: the neutral zone. I divided the back seat into three areas. Dustin's area on the left, Dawson's area on the right, and the neutral zone in the middle. Same instructions: Dawson, you stay on this side, Dustin, you stay on this side. There is no way you should get near each other because there is this huge neutral zone in the middle. No one gets in the neutral zone. And, there was peace in the Hunt car. . . for about 6 minutes. Then another fight. Then another plan: the mini van! Dustin, you go on the right side of the back seat. Dawson, you go on the left side of the middle seat. I figured their arms were not physically long enough to get in each other's kingdom now. There was peace in the Hunt van. . . . for about 6 minutes. Then a new plan, and it worked. I moved my kingdom in between Dawson and Dustin's kingdom. My wife drove, and I would sit in the middle seat. Dawson would be in the front seat, Dustin in the back. With my kingdom in between Dawson's kingdom and Dustin's kingdom, there was indeed peace in the Hunt minivan. The point is this: we don't use the word kingdom, but the concept is innate. We are very interested in kingdom. Next two questions: What is it like when God is king (in the kingdom of God) and what is like when He is not? That is the topic of next week's article, but here is a preview: in God's kingdom there is love, joy, peace, patience, kindness, goodness, gentleness, faithfulness and self-control. In God's kingdom I am feeling a little more loved and am behaving a little more loving. I am more joyful. I smile more. I am more at peace. Anyone want that kingdom? That is next week's article. 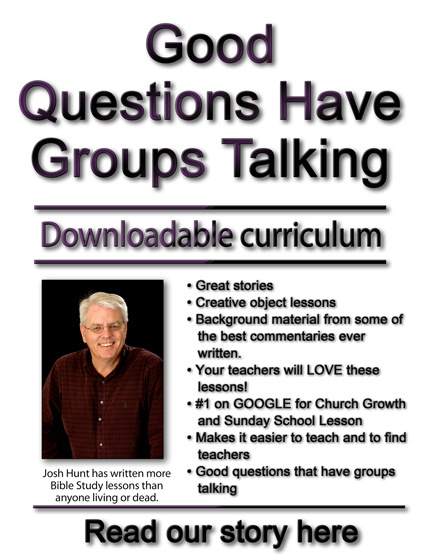 If you would like some help in teaching people in the kingdom, I'd invite you to use my Good Question lesson helps. They are taught from a, "How to live the John 10.10 life" perspective. And, here is some more good news. They are in the middle a huge overall. (I am sooooooooooo excited about these new lessons! You will LOVE them!) I am adding footnotes from some of the best, most well-respected commentators that have ever lived. Second, I am adding a creative element to every lesson--a movie clip, a song, something you can touch and feel, etc. Something to make every lesson POP. Something to get people talking. Your teachers will love you for providing the NEW Good Questions for them. See www.joshhunt.com for details.